The Triumph Tiger 800/800XC SU rack has our new Point1 pressed insert design and welded in Inner Tool Rack mount plate. This adds to the ease and functionality you've come to expect from our pannier systems. Details HERE. Bike width with SU rack installed: 24"
Aftermarket Exhaust Compatibility:Our SU rack is compatible with both the Leo Vince and Arrow aftermarket exhausts. Is the SU rack for the tiger 800 xc symmetrical? Based on the pictures, it appears to be but I wanted to make sure. What is the warranty on this rack? What is the suggested weight limit if using hard panniers? The Happy Trails Tiger SU Rack HTP8-2-1.1T is symmetrical. Happy Trails SU Side Rack Triumph Tiger 800/800XC SKU: HTP8-2-1.1T now comes standard with the left side SU having an Inner Tool tray Base (made of steel) welded on. This feature allows for the use of the Inner Tool Tray HTP0-0-25.1T. Warranty is for defects in workmanship. Concerning weight limits we always refer to the owners manual to establish the max weight that can be carried on any bike. 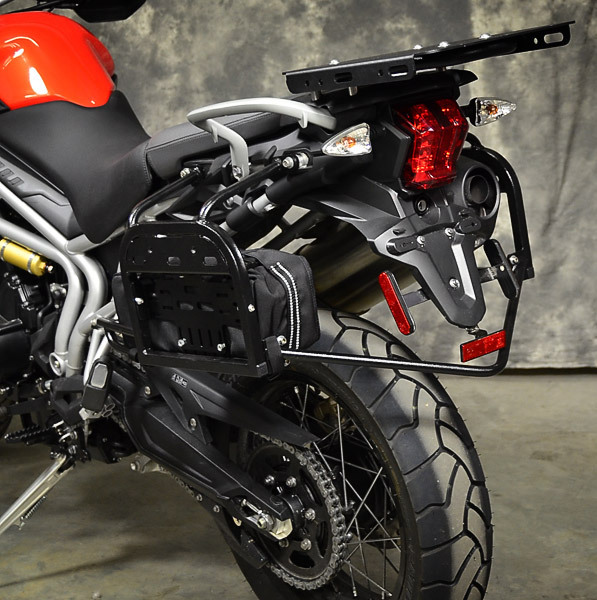 Can I use these racks along with the Pannier Mount Kit to mount ammo cases on my Tiger 800xc? Thanks! Yes you can mount alternative military equipment on the Happy Trails SU Racks with the 750 Puck Kit. The part # HTPMK750.1 is waht you would want to order. Make sure the back of the container is flat. The square fuel/water cells I previously asked about I just learned they are called rotopax.